Mitch, Debbie E. and Caren! Congrats, Mitch, Debbie E. and Caren, and thanks for entering. Your awesome prizes will be on their way to your mailboxes shortly. Enjoy, and thanks again for checking us out at TV Screener.com! Season six just premiered, and to celebrate another hilarious season of It’s Always Sunny in Philadelphia, Fox Home Entertainment has given TVScreener.com three copies to give away to our readers! Hey-oh! 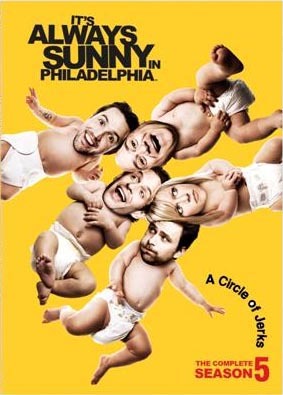 It’s time for another round of outrageousness as the irrepressible gang returns – more rude, crude, dysfunctional, and downright hilarious than ever before in It’s Always Sunny in Philadelphia Season Five, which arrived on Blu-ray and DVD on September 14th from Twentieth Century Fox Home Entertainment. From Internet dating and in-vitro fertilization to an uproarious road trip to the Grand Canyon, Season Five is loaded with seductions, interventions, back-stabbings, and beat-downs. You’ll find Dennis’s foolproof method (that no one else seems to grasp) for scoring with chicks, Frank wearing skinny jeans, and, of course, Flipadelphia! Brace yourself for a shot of laugh-out-loud insanity and see what’s on tap at Paddy’s Pub, the worst – and funniest – bar in the world! The It’s Always Sunny in Philadelphia Season Five Blu-ray and DVD feature all 12 original episodes and comes loaded with special features including deleted scenes, commentary from the cast, a blooper reel, featurettes and more. What is the name of the gang’s bar? I love sunny& would luv to win. The answer is Paddys. Paddy’s Pub, home of the Kitten Mittens. Paddy’s Pub!!! I love Sunny!!! Oh man it’s soo Paddy’s Pub, in Sunny Phili. Paddy’s Pub. Yup, that’s it. The name of the bar is Paddy’s Pub. It is Paddy’s Pub. Thanks and the “luck ‘o the Irish” to all!